First off the packaging looks to be done well so hopefully that will minimize shipping damage, and help assure an operational product when you receive it. 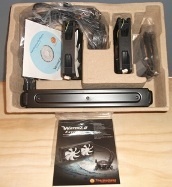 The mounting hardware includes everything you need for multiple platforms. The heat sink comes with pre applied TIM and it will be used for the test conducted in this review. The Thermaltake software that comes packaged with the unit is a snap to set up and makes it easy to choose the preferred fan speeds for your needs. Easy to navigate; you can set it up with predefined parameters or customize it to suit you specific needs. The simple easy to read display of all the pertinent information is refreshing. 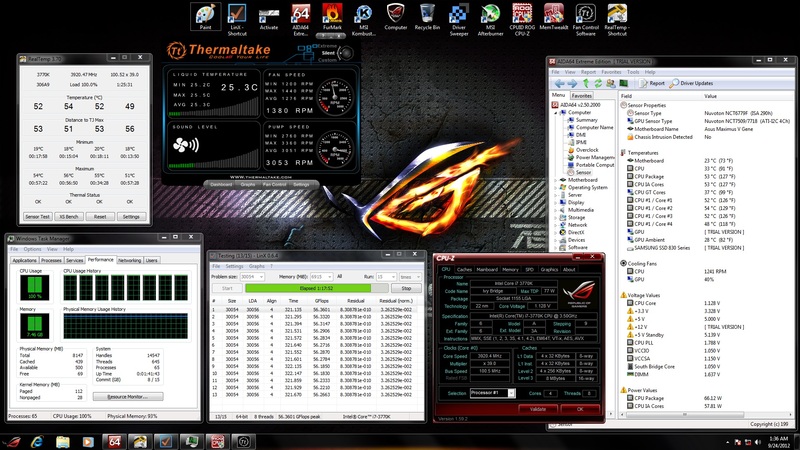 To test the WATER2.0 Extreme out, I am using the Intel LGA1155 platform. I will be using LinX0.6.4- Simply linpak to create the CPU loads for these tests. Hyper Threading also will be enabled for all tests. This will give us a great barometer of 8 threaded 100% loads as well as maxing out the 8 GB of RAM @ 2666 MHz so we know the IMC is getting punished as well. As you can see there is no serious gain at stock speeds with the extreme setting over the silent, however keep in mind that ambient temperature was 1.2C above the ambient when testing the Silent mode. So if you’re fighting for every degree the Extreme mode looks to grab you a degree or two. I tried 4.6 Ghz with the silent mode and could not get it stable enough to run LinX for more than 35 minutes. The temps were running in the mid 80’. Since I have been running it for about an hour for these tests I have disqualified the silent mode results at 4.6 GHz. So as it turns out extreme mode really stretches its legs when overclocking, and the unit seems to have no problem at these clock speeds on the extreme setting. Next I am going to put some aftermarket fans on the unit to see if there is a benefit to a push pull configuration. Since I do not have any PMW fans handy I am just going to use some AOC Florescent fans I have on hand, they are 79 CFM eachwith no speed control. Let’s see if these fans can help out a little, a lot or not at all ………. Once again the results are negligible but a degree better than the single fans. So here it is again, if you are fighting for every degree the unit performs a degree better with a push pull configuration with fans that were used for this test. Results may vary depending on the aftermarket fans used. Being the radiator does not have a real tight fin design it will lend itself to perform well with low speed fans as opposed to ridiculously loud high CFM fans. No need for Deltas here. Please keep in mind all temps are max temps not average read with Real Temp. The unit across all tests performed admirably. The build quality of the components seems to be very good. 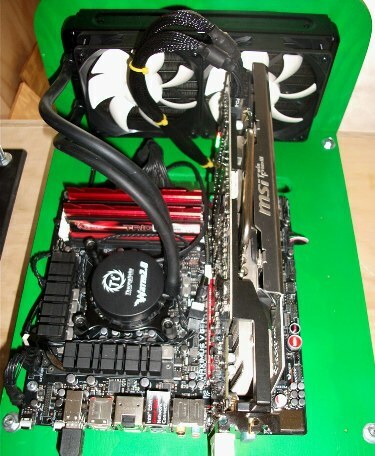 The fans provided are adequate and up to the job and when in silent mode not audible over the video card. On Extreme mode they are not obtrusively loud either, and much quieter than any air to air solution I have used with this type of performance. The hoses and pump seem to be very sturdy and well built, at 12” in length they should be able to accommodate top of case mounting even on full towers. The mounting system was thought out well and is easy to install. but quieter than my 655. 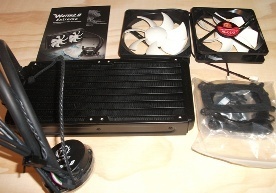 The radiator provided is quite capable and the fin design lends itself to the use of lower speed fans. At a thickness of 36.5125mm the 240mm design delivers the goods. The software provided is not earth shattering, it simply works very well and is easy to navigate. and made water cooling reachable for anyone with a computer and mounting accommodations for the 240mm radiator. Testing and looking over this product thoroughly, it is difficult to see many down sides to this unit; the price point for this kind of performance is more than fair and the quality is spot on. Last edited by Witchdoctor; 09-27-2012 at 10:32 PM. Looks good Witchy, I'm liking the not obscenely loud in extreme mode too. Seems beefy enough. Easy mounting is a must. I like it too, nice font choices. 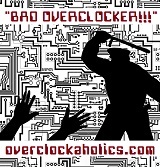 Thanks guys, it is my first review.
" Set it and Forget it "
Last edited by Witchdoctor; 10-01-2012 at 01:24 AM. What good is a water cooling review with out pushing the said unit to the brink ??? I concur, wth you want with watercooling cept that you'll be pushing the performance limits of the hardware? If you want quiet then buy an abacus. I also liked the font choices Gave it a clean look and easy read.